The North Eastern Indira Gandhi Regional Institute of Health and Medical Sciences (NEIGRIHMS) in Meghalaya has topped the list in Group-B hospitals and institutions and it was chosen by the Union ministry of health and family welfare for the Kayakalp award for the year 2017-18. The thrust of Kayakalp is to promote cleanliness, hygiene and creating sustainable practices. Kayakalp award to public health facilities was launched on May 15, 2015. 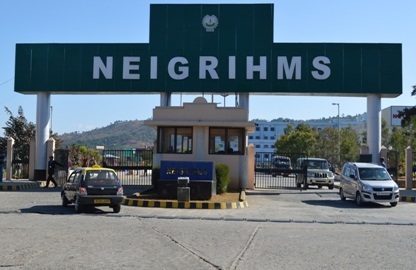 In a statement issued in Shillong on Monday, NEIGRIHMS Public Relations Officer, Kawal Krishen Pandita while informing that NEIGRIHMS topped the list in Group-B hospitals and institutions, said an award of Rs 1.5 crore has been sanctioned to NEIGRIHMS. He said that NEIGRIHMS left behind hospitals and institutions like AIIMS Bhubaneshwar, NIMHANS Bangalore, AIIMS Rishikesh that came second, third and fourth respectively. NEIGRIHMS director D M Thappa congratulated the medical superintendent and his team of doctors and officials who worked hard throughout the year to get the first position in the Kayakalp award.